By making your own pizza recipes from scratch give you the control of your toppings so you could make a healthier pizza. Or just add that extra cheese topping. Pizza is a world-popular dish of Italian origin, made with an oven-baked, flat, generally round bread that is often covered with tomatoes or a tomato-based sauce and mozzarella cheese. Other toppings are added according to region and culture. New York-style pizza is a style originally developed in New York City by immigrants from Naples, where pizza was created. It is often sold in generously sized, thin and flexible slices. It is traditionally hand-tossed, moderate on sauce, and moderately covered with cheese. Neapolitan made with a relatively thin, circular crust and served in wedge-shaped slices, and “Sicilian”, or “square”, made with a thicker, rectangular crust and served in large, rectangular slices. Greek pizza It has a thicker, chewier crust and is baked in a pan in the pizza oven, instead of directly on the bricks. Plain olive oil is a common part of the topping, as well as being liberally used to grease the pans and crisp the crust. Variations in other parts of the country include using feta cheese, Kalamata olives, and Greek herbs such as oregano. 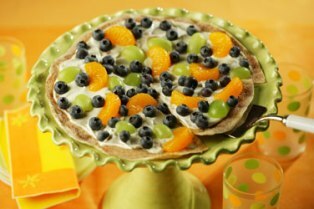 Dessert Pizza has a medium crust sometimes topped frosting, cinnamon, chocolate chips, marshmellows, nuts, fruit and more. Chicago-style deep-dish pizza Chicago-style pizza contains a crust which is formed up the sides of a deep-dish pan. It reverses the order of some ingredients, using crust, cheese, filling, then sauce on top. Some versions (usually referred to as stuffed) have two layers of crust with the sauce on top. California-style pizza refers to pizza with non-traditional ingredients, especially those that use a considerable amount of fresh produce. 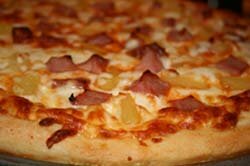 Hawaiian pizza has “Canadian bacon” (or sliced ham) and pineapple toppings with Mozzarella cheese. Grilled pizza, is a great way to make pizza with a fire paked taste. Usually done in the summer time. It has a fairly thin crust cooked directly on the grill; the toppings are placed on the baked side after the pizza has cooked for a bit and been flipped over. English muffin, French bread pizza and Bagels pizza are common convenience pizzas made at home in an oven or toaster, usually with a simple topping of tomato sauce, sliced or shredded cheese, and perhaps pepperoni. Frozen pizza normal a easy prepackaged food you pop in the oven and bake. The crust is normal lightly baked half way through. Pizza sauce is most commonly a tomato base sauce with thyme, basil, sage, marjoram, savory and oregano. Infused oil and a great way to flavor the dough for pizza or breadsticks before adding the tomato sauce. These oil keep well in refrigator for a longtime. What kind of toppings are you looking for? 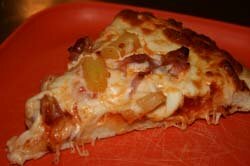 List of possible toppings to add to your pizza meal.